I recently got a group of 6 Corydoras bilineatus 'San Juan' and thought I'd share a few observations. These were recent imports but they all look healthy and are settling in well. They eat anything that comes their way and don't seem to be very fussy in regards to temperature or water hardness/softness. What little information I could find about them suggests that they are somewhat more delicate than the majority of Corys and are sensitive to water parameters (at least as regards to breeding). Most information I found suggests that these are not easy to breed. I wonder if this is due to any innate sensitivity or if it is just that these Corys have not been bred in captivity for lots of generations. Look at angels and discus, the wild caught fish are much more sensitive and more difficult to acclimate or breed than the strains that have been in captivity for a long time. The other thing I have seen is that these fish are definitely mid-water swimmers. That was a surprise! There are other mid-water Corys of course but they are definitely a minority. When I feed the tank they will go down to the bottom to get food, but the rest of the time they like to swim in the middle of the tank. They like to "vacuum" the plants and will even swim near the surface to nibble on the roots of the floating plants. I haven't found any written references to this behavior but did find some videos on YouTube where they behave exactly the same way. Other than this they have typical Cory behavior. If you know of any special requirements for these Corys I'd love to know! <Thanks for your very informative observations. Will certainly share! Thank you! I had not realized these were in the C. elegans group, that is very helpful. They are in QT right now, was planning on putting them in my community tank but now think it would be nice to set up a tank just for them. Sand bottom, lots of plants. It would be nice if I can get them to breed! <Presumably much like C. elegans, though that certainly isn't as easy to breed as some of the others; I've bred Corydoras paleatus of course, but then again, who hasn't?! My name is Gabby and I'm new to aquariums (had one since August) and loving it.i've slowly built a community tank (doing lots of research) since then and it's gone quite well. active, but during feeding seems to have eaten less than the others. Should I just keep monitoring him? Any suggestions? <Catfish lose their barbels for two reasons. Or rather, there are two things going on that interact, resulting in the barbels getting shorter. substrate is silica sand (a lime-free sand, sometimes called "pool filter" or "smooth silver" sand). What happens is the barbels get damaged, and that's when the second part of the process, bacterial infection, sets in. I also have a question about his lost barbells. When I decided on Corys, I decided on sand. The guy at the aquarium shop told me coral sand works, but now I'm wondering if it's the cause of his barbell loss. <Coral Sand was a terrible choice. Bad advice from the retailer there! The other three and their barbels are fine. Is this sand too rough? Any thoughts or recommendations would be much appreciated. This little school is rivaling my Betta for favourite status, and I want to make sure they are healthy and happy. Thank you for your quick response! I'll go out and look for silica sand right away. <Cool. Aquarium shops sell it, but it's often cheaper at garden centres. What would you suggest to increase oxygen flow at the bottom of the tank? I have a hang off filter. <If all else fails, an airstone weighted down so it draws water up from the bottom of the tank (that's what the air bubbles do) to the top of the tank. Man, so much to learn still! <Yes, James, Corydoras can have trouble swimming all the way to the top. Like most catfish, they lack big enough swim bladders for neutral buoyancy, and need to active paddle upwards or they sink. In the wild they mostly live in streams that barely cover their backs rather than the main rivers. So water depths in the 20-30 cm/8-12 inch range are ideal for Corydoras, with up to 45 cm/18 inches generally acceptable provided (a) the water current isn't so strong that the catfish have trouble swimming upwards and (b) there aren't any boisterous or aggressive tankmates that might harass them as they swim to the top. Water temperature and water circulation are critical factors too. Corydoras are facultative air-breathers, meaning they only breathe air when they need to. Cool water has more oxygen than warm water, which is one reason Corydoras mostly do best between 22-25 C/72-77 F, and only one or two traded species, notably Corydoras sterbai, being truly happy up to 28 C/82 F. In cool water they may hardly ever gulp air. Hi there. I have two albino Cory cats in a 10 gallon tank with my Betta boy. The larger of the Corydoras has always been a very busy, robust fish. sometimes sits at the top of the tank, seemingly making a bubble nest. so, any thoughts on the behavior? The tank is about a year old, cycled, stable. It has several live plants, and no surface "oil" that would prevent oxygen transfer. I wonder if the fish is actually a different species (though it looks like a Cory to me) or if the little fella thinks he's a Betta... just kidding. I would appreciate your insight. I wrote about a week ago on another issue, and never received a reply. I'm hoping I didn't do anything wrong and my message was just overlooked! As it is, that issue seems to have resolved itself for the most part. Now I'm dealing with something in my other tank, and I'm hoping for some insight from more experienced hobbyists than myself. Tank: 14gal (functionally about 11-12gal with substrate and lowered water level), Aqueon filter that came with the "starter kit", temp steady at 75*F, fully cycled and has been set up since early December 2010. The pH runs pretty steady at around 8. I always treat new water with Prime. Residents: 3 peppered Cory cats, 4 albino Cory cats, 2 juvenile mystery snails. The Corys are being quarantined here, their eventual home is a 55gal. I've had them for about 2 weeks. I performed my usual 30% water change, all I had time for, with plans to do another this morning. Performed nearly 70% water change. Retested. Now for the main problem: One of the albino Cory cats has been acting lethargic for the last couple of days, is not eating well, and after last night's water change floated belly-up for a few minutes despite all my attempts to match temperature, etc. with the new water. I was afraid we would lose him, but this morning he's better. Not great, since he's still spending most of his time resting on the bottom or swimming *very* slowly a few inches, but he's not floating. Everyone else in the tank, including a new baby balloon molly that hitchhiked home with the Corys, is acting and looking fine. Even the snails, which I thought would be the first indicators of poor water quality. The only thing that changed recently is my husband taking over morning feedings for both tanks for the last week. I think he's been overfeeding this one, because I don't know what else would have caused such a large nitrAte spike in such a short time. There was a lot of "gunk" when I cleaned the tank, which isn't normal. I've taken over feeding again. Most of the reading I've done (Google is my friend, yes?) suggests that nitrAtes aren't *that* toxic over the short term, but these levels are pretty high and I've seen people mention again and again that Cory cats are "sensitive" fish. Could the nitrAtes spike alone be the cause of this little guy's problem? If so, will continued water changes and much reduced feeding be enough to resolve it? If not, what else would cause an otherwise healthy-seeming fish to be lethargic and go off its food with no other sign of disease? I'm a loss on this one! Thank you so much, I appreciate your willingness to help out newbies like myself with your amazing wealth of experience! P.S. Is it just me, or are Cory cats just the funniest/cutest little fish ever? 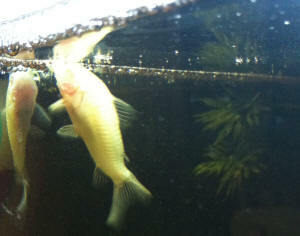 These are albino and peppered Corys (Corydoras aeneus and Corydoras paleatus). The lethargic one is an albino. so I stuck with platies for our main fish. I was told that with careful acclimation the Corys would be ok, and honestly the other 6 look perfectly fine. I'll look into the RO water option, but if I can't get the pH down enough, should I find a new home for these fish? I use the Prime instead of whatever brand dechlorinator came with my starter kit because we have copper piping in my house. I wanted to be extra careful to avoid getting copper in my aquariums and killing snails/fish. The albino Cory is still alive, but he's pretty much the same as yesterday -- not swimming much, resting on a rock most of the time. I haven't seen him eat. I did one more water change last night, being careful to get the rest of the "gunk" out of the gravel. The nitrates are now reading between 10-20ppm, which is where the tank was before its regular water change the previous week. I'm going to be feeding lightly and testing the nitrates daily for the week, I think. I'll also be buying some more plants soon, so that will probably help a bit. I read as much as I could about Corys/nitrates/etc. on WWM and the 'net in general before I posted, but I probably missed something. I'll go back and check out the links again. Thank you again for the response! Thanks for all the great work you do. I'm hoping you can help me again. One of my four albino Corys has been behaving very oddly over the past few days. He eats normally with the others each morning and swims around a bit but then spends much of the rest of the day lying on his back, appearing to be dead, until he is poked or touched by something. The first time I saw this I thought he was dead but when I went to net him out of the tank he immediately jumped up and started swimming around normally. Each day since then I have noticed him doing the same thing but as soon as I put the net near him he rights himself and swims away. I saw him do the same thing when he was nudged slightly by another fish. Is he really sick or is there some other explanation for this weird behaviour? The other three are behaving perfectly normally. You've been helpful in the past when I had questions about my first aquarium and some stocking advice for my second, so thank you. I did want to ask something about 6 new Panda Cory Catfish I added a couple weeks ago. They are the newest inhabitants to a ~4 month old cycled aquarium. They share a 46 gallon with a school of 9 Harlequin Rasboras, 6 Cherry Barbs, 3 Oto Catfish, and one last cycling Platy that's been tough to net out. Anyhow, as of yesterday morning I noticed one of the smaller Cory catfish do a few quick darning motions in the gravel on his side while scavenging for food. He only did it a couple times until the others joined him to start eating the pellets I dropped for them. I looked at the fish but didn't appear to have anything on his side, nor any discoloration (nothing I can see), and he's been actively swimming and searching for food as always. Then this afternoon, about an hour after they finished eating any dropped pellets, I saw the same behavior again; 2-3 quick darts in the gravel, and only in the gravel not on the decorations where I normally feed the catfish. It is a normal aquarium gravel, black, not sand nor a fine gravel that I've heard Cory catfish like to dig into. I still cant see anything wrong with him nor any of the other fish, including any of the other catfish. He still swims actively around and all over the decorations/plants as usual looking for food, so he doesn't appear sick. or something of the sort and nothing to worry about, or if it's some sign of a disease that just isn't visible? Thanks as always for all that you do. Tank was set up and planted in October, stocked in January. I've observed a change in behavior in my Corys and Otos over the last few weeks. In the past, the Otos would spend time on the front and side glass of the tank during all hours of the day/night. Lately, they stay in the small space between the HOB filter and the back glass of the tank. They will venture down to the substrate at night to eat algae wafers (Hikari brand), but ignore the blanched zucchini and carrots I place in the tank which they used to eat with gusto. The Corys, while always skittish, used to venture around the tank in a shoal, especially when I fed the Rasboras. After not seeing any of them for weeks, and assuming they had perished somehow, I found them hiding in a tiny crevice, all on top of each other, between the driftwood and the substrate, when I shined a flashlight into the tank to try to find them. They also now seem to venture out only at night for the sinking wafers (Hikari brand) I place in the tank at lights out. I know that Corys are nocturnal in the wild, but this is a recent development, hence my concern. I'm not sure what caused the change in behavior as my feeding and maintenance regimens have remained the same. Water quality has also remained constant. My first thought is an aggression issue with the Rasboras, but I have never observed any aggression. I had also thought that I might need to add Corys to the tank to see if increasing the size of the shoal would bring them out into the open more often, but I believe my tank to be fully stocked as is. Do you have any thoughts on what would cause this change in behavior and if there is something else I should be doing?